Excited by the world of astronomy? Thinking of buying a telescope, perhaps as a gift for the kidlet? Glad I got to you in time. Your choice of a first scope is a crucial one that can literally make the difference between astronomy as an enriching and lifelong hobby, or spent exercise marked by a piece of junk collecting dust in a closet. The good news is that despite the bewildering array of choices, it's not that hard to choose a first telescope. In fact, when shopping for your first scope, it is most important to know what not to buy. I'll begin with the single most important piece of advice for getting a good telescope: DO NOT BUY A TELESCOPE IN A DEPARTMENT STORE. Just don't do it. If you follow only one piece of advice from this article, this is it. Cheap department store telescopes are a waste of money. That includes scopes you see on cable TV shopping channels, at most photo stores, hobby stores, electronics chains such as Fry's, Circuit City, and Best Buy, as well as mall specialty stores such as "The Science Shop", "The Nature Channel Store", and the like. So, where should you buy a telescope? That's easy - from a store that specializes in telescopes. In the San Francisco Bay Area, Scope City in San Francisco and Orion Telescopes in Cupertino are both excellent choices. If you do not live near a telescope store, you should consider ordering online from a place which specializes in telescopes. Here's an easy rule of thumb: Do not buy any telescope that is marketed on the basis of magnification. That is a certain sign the scope is a mass-market, poorly built instrument that will drive you away from the hobby. Contrary to what common sense might lead you to expect, magnification is not all that important when selecting a telescope. Why is Magnification not Important when Selecting a Telescope? Instead of getting a telescope first, why not go with a pair of binoculars? That's how I got my start in astronomy. You can buy a good pair of astronomy binoculars for less than $100. This is a great introduction to astronomy if you're on a limited budget. Or maybe you already have a pair, in which case you can get started for free! Binoculars are a big step up in viewing power compared to the naked eye, and give you a chance to learn the night sky. They will show you the Moon, comets, the moons of Jupiter, star clusters, double and variable stars, nebulae, and even some galaxies. They offer wide fields and a view oriented the same as you see with the naked eye. This makes finding things with binoculars much easier than with a telescope. And believe it or not, some objects in the night sky often look better through binoculars than they do through telescopes! Comets are but one example. If you find that you don't like astronomy, you can use your binoculars for lots of other activities, such as hikes, nature, ballgames, etc. If you like astronomy and want to go further, you will still find the binoculars useful as an observing tool to complement your telescope. 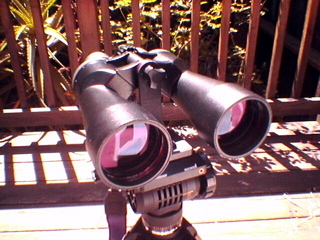 Nearly every experienced amateur astronomer has at least one pair of binoculars in their stable of observing equipment. While you learn the night sky with your binoculars, you can research the various types of telescopes and what might interest you. You might also save up the necessary funds. At some point - and you will know when that is - you will be ready to take the next step and purchase the telescope of your dreams. Sky and Telescope's Guide to Telescopes and Binoculars. But I Really Want a Telescope! Despite my suggestion to start small with binoculars, most beginners won't want to hear that advice. They want to get started doing "real" astronomy, and of course "real" astronomy involves using a telescope. So knowing that you're really itching to get started with a telescope, here's a rundown of the different types of telescopes you might find in an astronomy store. The vast majority of telescopes you find on the market will fall into one of three (or four, depending on how you classify them) different types. The refractor telescope is what most non-astronomers think of as a "telescope". It has a long, tapering tube with a big lens on one end and an eyepiece on the other end that you look into. Light goes into the lens, through the scope, out the bottom and into your eye. Refractors are further broken down into types according to the level of color correction they offer. "Achromatic" scopes offer a reasonable amount of color correction, but can display blue or purplish halos around bright objects such as the Moon or planets. "Apochromatic" scopes incorporate more lens elements and exotic glass types to offer high degrees of color correction, for crisp views. And there is a third type, "semi-apochromat", describing a scope with better color correction than most achromats, but not to the color-free level of apochromatic scopes. As you would expect, apochromatic scopes cost more than semi-apochromats, and significantly more than achromatic scopes. The advantage of a refractor telescope is the level of contrast, crispness and detail available in the image. Refractors are superior to all other telescope designs at the same aperture. But they also cost the most to make, and they are simply not available in larger apertures (above 6 inches) that other optical designs offer. Orion. The Orion ED-80 apochromat is a fantastic value and an excellent first telescope. Or consider the venerable ShortTube-80 (shown in photo, situated on a lightweight alt-azimuth mount) for an inexpensive, easy-to-use, achromatic scope that delivers wide-field views. StellarVue. The Nighthawk series is a good starting point for beginners. William Optics. The ZenithStar scopes offer high quality and excellent value. Tele Vue. If you have lots of money to spend, Tele Vue scopes have exquisite optics. Unlike refractors, reflector telescopes aren't immediately recognizable to non-astronomers. They look like long cylindrical tubes sitting on tripods, or Lazy-Susan style mountings that resemble cannons. Reflector telescopes also don't feature a lens facing the sky. Instead, they use a large mirror mounted at the bottom of the tube to collect and focus light. A second, much smaller mirror mounted at the sky-facing end of the tube deflects the light out to an eyepiece at the side of the tube, where the viewer looks into the scope. Reflector telescopes inherently have perfect color correction. Because the optics are relatively simple, they can also be built in larger apertures for less money than any other type of telescope. In fact, all professional observatories now use reflecting telescopes of some form or another. Because the main mirror can be very large (mass-market reflector scopes go out to 16-inch diameter mirrors and specialty telescope makers offer sizes twice as wide), it has more surface area to collect more light. This additional light-collecting ability can pull in fainter objects such as nebulas and galaxies, and it can often tease out additional detail when viewing celestial objects. However, reflectors do have their downside. The small, secondary mirror does block the light path, creating a shadow on the main mirror that is distributed throughout the view you see in the eyepiece. So reflectors typically don't offer the contrasty, pin-point view that is so typical of a refractor telescope. They also can be large and difficult to transport, unless you spend more money on fancier designs that break down and fold for transport in a car or truck. Orion. The Intelliscope series of Dobsonian-style reflector telescopes sold by Orion are probably the best way for any beginner to get started in astronomy. Meade. Meade offers the LightBridge Dobsonian-style reflectors, which break down for easy transport. Parks Optical. Parks makes nice, traditional tripod-mounted equatorial reflectors. The Schmidt-Cassegrain telescope, and its close cousin the Maksutov-Cassegrain, are examples of compound telescopes. Compound scopes (also called catadioptric scopes) combine both lenses and mirrors. You can spot them easily due to their short, stubby cylindrical shape. Compound scopes provide good optical performance at a decent cost with small size and excellent portability. 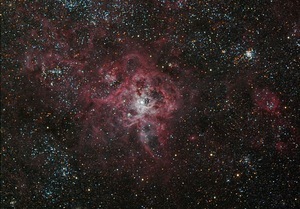 For these reasons, they are very popular with amateur astronomers. For a long time, the 8-inch Schmidt-Cassegrain scope (shown here in photo) was the ideal starter scope for the serious amateur astronomer, and today it remains an excellent choice. The main disadvantage of compound telescopes is somewhat similar to reflectors, only more so. Compound telescopes also have a secondary mirror obstructing their light path, and typically it is larger in relation to the size of the scope than with reflectors. So given a refractor, a reflector, and a compound telescope all of the same size, the compound scope will typically have the least contrasty and detailed images. Still, a well-made compound telescope is still an excellent performer, and for many people the benefits more than outweigh any disadvantages. Almost all Schmidt-Cassegrain telescopes are made by either Meade or Celestron. Both company's offerings are competitive with each other, so it ultimately matters what manufacturer appeals to you the most, and what kind of deals you can get. Orion. The StarMax series of Maksutov-Cassegrains offer excellent performance and are very affordable. Meade. The ETX 90 and 125 scopes are Maksutov-Cassegrains with a built-in computer. Celestron. Celestron also offers Maksutov-Cassegrains with computerized mounts. Just as important as the scope itself is the mount, or apparatus that supports the telescope and allows you to aim it about the sky. Telescopes typically work at anywhere from 30 times magnification to 300x or more. Telescopes magnify not only celestial objects, they also magnify any motions of the mount itself. If your telescope sits on a weak or rickety tripod, the view through the eyepiece will forever jiggle and wiggle from the vibrations of the mount itself, and you will never be able to get a satisfying view. Additionally, a sturdy, accurate mount is absolutely critical for accurate aiming of the the telescope. Again due to magnification, a telescope typically shows a very small region of sky, smaller than the area of your thumbnail viewed from arm's length. If the parts are poorly machined, the mount will not move precisely and will not be able to accurately find objects in the sky, even with the assistance of a computer. Poor-quality mounts are the major reason why mass-market telescopes sold in department stores are unsuitable for any sort of astronomy work. Even expert astronomers can't aim them and make them work properly; what chance will you have? There are various types of telescope mounts, but they break down into two basic types. You will find these mounts paired up with all types of telescope optics - refractor, reflector, and compound scope. Every telescope mount has two axes upon which it independently turns, to allow the scope to point at any spot in the sky. An equatorial mount is special in that one of the rotation axes is aligned with the axis of the Earth. You do this by adjusting the angle of the axis for your latitude, then aiming the axis at Polaris, the North Star, using a sighting device (or with the Southern Celestial Pole in the constellation Octans, if you live in the Southern Hemisphere). You have to re-align the mount with Polaris each time you set it up. Once the mount is aligned, all rotation on the north-south axis traces a precise line between east and west in the sky. This movement matches the movements of celestial objects, which rise in the east and set in the west. So an equatorial mount is very useful for automatically following celestial objects. A well-aligned equatorial mount will keep a planet, nebula or galaxy centered in the eyepiece for hours on end, allowing you the opportunity for detailed study. The ability to precisely track celestial objects also makes equatorial mounts very popular with astrophotographers. Equatorial mounts are rated for the amount of weight they can carry yet still move and track accurately, as well as for the precision of their tracking mechanism. Naturally, the bigger and more accurate you want the mount to be, the more you will pay. Shown here is a Schmidt-Cassegrain telescope, situated on an equatorial mount (in this case, a German Equatorial). Note the counterweight at the end of the long shaft opposite the scope, which is typical of this design. An alt-azimuth mount also has two axes to rotate the scope. The difference is that alt-azimuth mounts need no special alignment. The azimuth axis rotates 360 degrees, from north to east to south to west, back to north. The altitude axis rotates 90 degrees from the horizon to straight overhead. 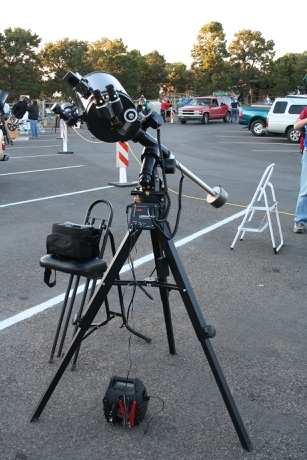 Unlike an equatorial mount, an alt-azimuth mount does not offer tracking capability, unless it is attached to a computer. On the other hand, it is simpler, less expensive, less bulky, drop-dead easy to set up, and drop-dead easy to use. 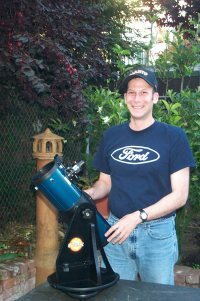 The most popular alt-azimuth mount is the Dobsonian mount, invented by John Dobson, founder of the Sidewalk Astronomers. The Dobsonian mount sits on the ground using a Lazy-Susan style turntable providing the azimuth motion. Upon this turntable rests a box providing bearings for the altitude motions. The combination of a reflecting telescope on a Dobsonian-style mount is very popular, and is often referred to as a Dobsonian telescope. 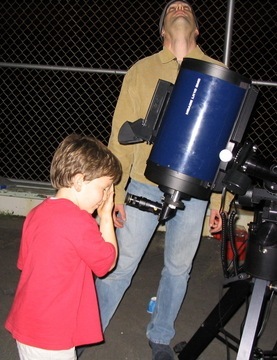 (Dobson prefers to call these telescopes "sidewalk telescopes"). 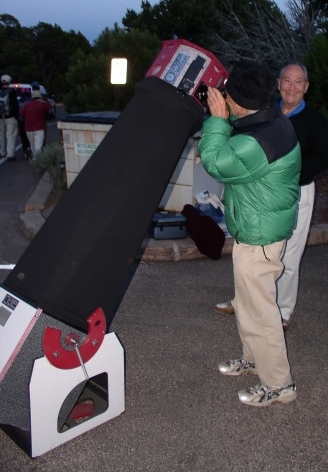 Shown here is John Dobson peering into a modern Dobsonian reflector telescope, at the 2005 Grand Canyon Star Party. This telescope is a truss-tube Dobsonian, which is lightweight, disassembles and nests for compact transport. See our feature on Dobsonian telescopes for an example solid-tube scope built to John Dobson's original design. What Type of Telescope is Right for Me? Telescopes are a little like golf clubs. In the same way there's a club (driver, putter, wedge, etc) that's appropriate for a given situation on the golf course, so too are various telescopes appropriate for different kinds of observing. It's important to keep in mind there is no such thing as a single telescope that "does it all". Each of the optical and mounting designs has its own strengths and weaknesses, which make them suitable for different kinds of use. While you can use a given telescope for any kind of observing, some work better than others. It's not uncommon for enthusiastic amateurs to own more than one telescope to suit the kinds of observing they do. With that said, here's a few suggestions for types of scopes to consider for various types of viewing. The sizes presented here refer to the telescope's aperture, or diameter of its main optics, be they mirrors or lenses. If you want to sweep the skies looking for grand views, or you want to go comet-hunting, consider binoculars or a wide-field telescope such as an 80mm (3.5") refractor. If you want to observe the Moon and planets, consider a 100mm (4") or larger refractor, or a 6" or larger reflector telescope. Schmidt-Cassegrain scopes 6" or better are also a good choice. You can view the Moon and planets from anywhere, so they're a good choice for observing if you live in the city and do not plan to drive out to dark sky sites. If you want to view bright deep-sky objects such as star clusters, variable stars, and double or multiple stars, a refractor (80-100mm, or 3.5-4" in diameter) is the ideal instrument. They provide tack-sharp views, without requiring the extra light grasp larger telescopes provide. If you want to view faint deep-sky objects such as galaxies and nebulae, you want the largest aperture scope you can afford and transport. Look into Schmidt-Cassegrain telescopes with diameters 8" or larger, or Dobsonian reflectors 8" or larger. If portability is a concern, because you must transport the telescope to a dark-sky observing site, or you have limited storage space, consider something small. Choices could include an 80mm (3.5") refractor, a Schmidt-Cassegrain or Maksutov-Cassegrain with up to 8" mirror, a solid-tube reflector with up to 8" mirror, or a collapsing truss-tube Dobsonian reflector such as the Meade LightBridge. If ease of setup/takedown is a concern, solid-tube Dobsonian reflectors are as simple as they get - just plop it down and start observing. If ease of use is a concern, Dobsonian reflectors take the crown here too. This makes them especially well suited for beginners. For beginners, alt-azimuth telescope mounts are a better choice than equatorial mounts. They are less bulky, as well as easier to understand and use. Equatorial mounts are mainly useful for people who want to take astrophotos. I Want to Take Astrophotos, Too. Often, when people describe their dream first telescope, they describe the mythical telescope that "does it all", including astrophotography. They describe a scope they can use now for through-the-eyepiece views, and will accept a camera later for taking sky photos. We covered the "does it all" scope already; sadly it doesn't exist. So as a first-time scope buyer, my advice is to not concern yourself over astrophotography, no matter how attractive the prospect may be. I know, I look at the stunning astrophotos published by amateur astronomers in books and magazines that rival Hubble photos in quality and attractiveness, and I think, "wouldn't it be cool to do that myself." Those photos weren't made with beginner equipment. The really nice photos you see on the internet, books and magazines were made by people who have sunk five and even six figures into specialized telescopes, mounts, cameras, computers, accessories, and software. And a host of special techniques for shooting and processing long-term, faint exposures. All three disciplines can only be acquired through experience. Successful astrophotographers spend a lot of time at what they do, learning from their mistakes and devising new and better ways to capture and process photos. I'm not saying you can't eventually be a good or even a first-rate astrophotographer; far from it. But as a first-time scope buyer, you need to gain the skills behind item (1) at a minimum before you can move on to astrophotography. And at that point, you will be in a much better position to identify and shop for the equipment you will really need to be successful as an astrophotographer. Basically, if you seriously want to do astrophotography you will end up buying new scopes and equipment, so you don't need to stress over it during your first purchase. If you don't want to be a serious astrophotographer, and only want to dabble, you're still covered. Meade and Orion both offer low-cost astronomy cameras that attach to nearly any telescope and take decent photos of the Solar System as well as other celestial objects. The techniques you employ using these cameras are the same as those used by accomplished astrophotographers using more expensive equipment, so they're an easy and cheap way to try astrophotography as a hobby. Since these low-cost cameras work with nearly any scope, there's similarly no reason to stress out over what you buy now. Get something and enjoy it now; let the picture bug hit you later. As a new astronomer, you might be in the market for a "GOTO" telescope. These telescopes have built-in computers that do the work of pointing the telescope and finding objects for you. Common brands include the Meade ETX and Celestron NexStar. The manufacturers of these devices claim to make astronomy effortless. I think GOTO is a great convenience for experienced astronomers - it saves them time, effort and allows them to focus on observing rather than operating their telescope. But the reality is that for beginners, computerized scopes simply substitute one set of challenges for another. I've found some would-be beginners come to the SFAA/Sidewalk Astronomers Telescope Clinics with GOTO scopes they've never used. The first thing a computerized telescope does when you turn it on is require you to point it at some stars that you know, in order to set it up. These beginners can't get past the computer's setup procedure, either because the hand controller is too confusing to use, or they don't know what stars to point the scope at. Since the computer is required for all aspects of the scope's operation, they never are able to use their scope. Ironically, this situation can be much worse than beginners who start with non-computerized scopes. At least they can hand-point their scope and look at the Moon, the planets, or random places in the sky if they don't know how to find objects. If you're the type of person that's good at figuring out computers and gadgets, then a GOTO scope might be a very good buy. If you are the type of person who has/had a VCR flashing "12:00" at home, you should consider buying a non-computerized scope, together with a good beginner's book to help you learn to find things. Keep in mind that a GOTO telescope will not excuse you from actually learning your way around the night sky. You still have to know the basic constellations and bright stars in order to set it up. But just think for a moment. Aren't you getting into astronomy because you want to learn these things? Most of the enjoyment of astronomy as a hobby is intellectual: knowing how absurdly far away that tiny dot you're seeing really is, or the significance of the dim, fuzzy blob appearing in the eyepiece. In fact, if you don't pick up some of the intellectual aspects of the hobby, you likely will not appreciate owning and using a telescope, because quite often what you see in the eyepiece really is a dim, fuzzy blob or a tiny dot. Learning the layout of the night sky, and getting to know the universe over your head, can be one of the most satisfying things you do with your life. In the ideal case, what a GOTO scope will do is relieve the requirement of learning lots of this stuff up front, so that you can tackle the fine points of the night sky at your own pace. And when you do know the night sky, they can save you time and effort. Finally, I don't recommend buying a GOTO scope in the $500 or under range. Too much of your $500 is going towards the computer, and not enough is going towards the scope. I've seen low-cost GOTO scopes, and the optics typically have small apertures (meaning you can't see much), with flimsy mounts containing plastic parts that wear out after a year or so of use. If you want GOTO, think at least in the $800 to $1000 range. If you're like most people, your eyes glazed over reading the very distilled summary of telescope designs and you skipped right down here to get a buying recommendation. I often advise against buying a scope without investigating for yourself, as do many amateur astronomers. The right telescope for you is different from somebody else, and it does make the difference as to whether you will actually use it. But still, people often ask for my recommendations. So here's mine: The Orion Starblast, from Orion Telescopes (pictured here). This is by far the best buy you can get in an under-$200 telescope, probably even under-$400. It's perfect for kids (and adults!) of all ages, it's portable, it is simple to use due to its built-in alt-azimuth mount, and it has fine optics. If you advance in the hobby and decide you want a fancier scope, you will still use this one because it is so portable and easy to use. (Several very experienced observers I know have purchased the Starblast as a second, "grab and go" scope). It comes with everything you need to get started, except a red flashlight, a good beginner's book and basic star charts. Starblast review by my friend Jane Houston Jones. If you still don't know what telescope to buy, you could consider building your own. The experience of seeing the universe through a telescope you built yourself, from plywood, cardboard and glass, is quite unique. This is the path I ultimately took. After observing with binoculars for some time, and researching my options, I came to the conclusion that I was ready for a telescope. And what's more, I was ready for the experience of building my own. To learn more about building a Dobsonian telescope, see our Telescope Making page. The following books have more information to assist you in your buying decisions. Star Ware: The Amateur Astronomer's Guide to Choosing, Buying, and Using Telescopes and Accessories by Philip S. Harrington is a wonderful guide to astronomy hardware. It goes into more detail than I can offer in this article, but it stays breezy and never lets you get lost in technobabble. It also contains a quiz that you can fill out and will recommend the type of telescope that's best for you. Star Watch: The Amateur Astronomer's Guide to Finding, Observing, and Learning About over 125 Celestial Objects, also by Philip S. Harrington is a companion volume that will teach you how to use your telescope and how to find things to look at with it. Also, check out the following websites for more telescope buying advice. Paul Mortfield's Telescope Buying Tips. Paul is an accomplished astrophotographer, formerly from the SF Bay Area.